We’ve made some exciting progress on the market the last couple months as well as having encountered a few setbacks. The exciting news is that the construction has been moving rapidly along. 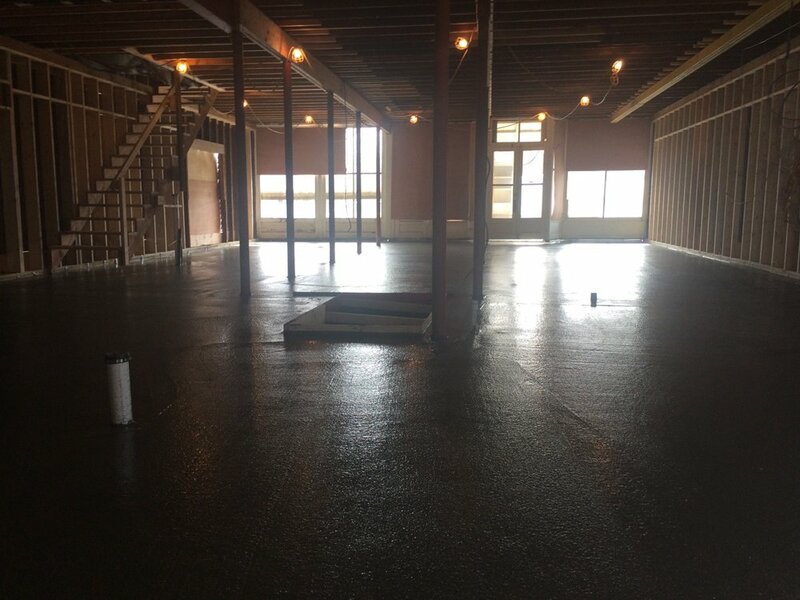 All the rough-in plumbing has been installed and concrete floors were poured in the market and the basement. The interior walls are in the process of being framed and it’s beginning to look like a store again. Upstairs, the insulation in the attic and walls got sucked out with a huge vacuum cleaner machine and the ceiling above the community space was opened up to create a cathedral ceiling. We still have a long way to go but it’s exciting to have gotten to this point of rebuilding after so much demolition and structural straightening. This building will easily last a hundred years and beyond and will bring together a diverse community creating, learning, eating, and enjoying life together. Meanwhile, the four of us have created a synergistic team and feel proud of what we’ve accomplished so far. Recently we started working with a business consultant whose specific expertise is in cooperative grocery stores. Through that process we learned that our hopeful timeline of opening this summer is not realistic. We still have a ways to go in order to create financial projections and a business plan that ensures when we open our doors this boat can float. Despite our initial disappointment that we’re not as far along as we anticipated, we’re turning lemons into lemonade and making plans to get the community space up and running first while developing our business plan for the market. This opportunity to spend more time dreaming about the kind of community space we want to create has helped our creativity blossom and we’re excited about the ideas that are taking root. We have initial ideas about a co-working and skill share space where people can work independently or together on business and creative projects while learning from one another. We imagine this as a space for yoga teachers, mothers and fathers, artists, healers, herbalists, farmers, passionate home cookers, bodyworkers, computer workers, those wanting to incubate small businesses and anyone passionate about sharing skills and creating community. What do you envision? We want to hear from you! Be on the lookout for an invite to a visioning session this summer! Thanks for your support and we look forward to dreaming with you soon! Please follow us on Instagram @randomharvestny to see our work in progress! P.S. Below is our finished logo! What do you think??? P.P.S. Here's a postcard of the original Random Harvest. Older PostWhy a Workers Cooperative?